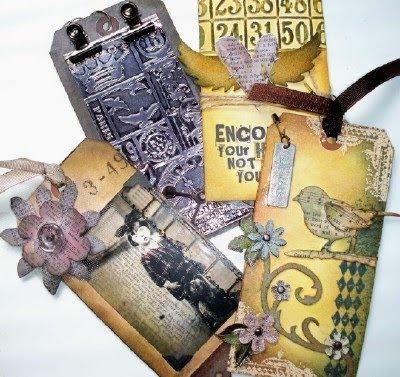 3 classes with Tim Holtz in Akron. what a wonderful giving teacher. The team worked like a well oiled machine to make everything go smoothly. Much was easily accomplished in a restricted time frame thanks to fabulous planning. A big thank you to Mario and Darcy for all their help. The first 2 classes were tags mainly to focus on technique....and boy, did we. 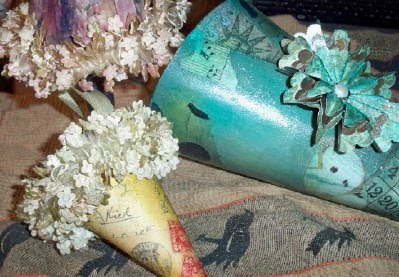 Little tricks that expand the uses of Ranger products, from distress pads to alcohol ink. 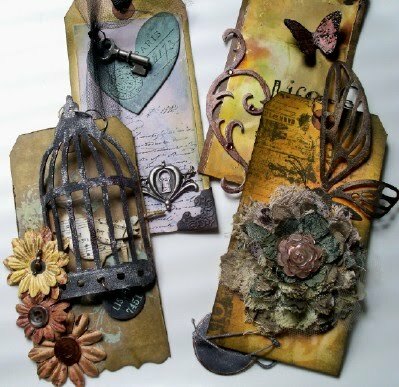 All I can say about the new alterations dies from sizzix is WOW. So many applications and they are just perfect.....the texture fades are just awesome. We also put alot of the idea-ology item to work on our projects. Again perfection.Stampers anonymous gave us an atc stamp, I thought that was very generous of Ted. So all in all,not only is Tim a charmer but a "think out side the box kinda designer". If you can, try to squeeze into one of his classes......This man does not disappoint. working, working, working, O.K. 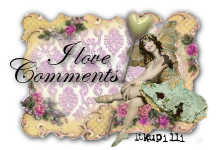 I admit it............I love making tussie mussies. It is nice to go outside in April in Ohio and absorb some spring and transfer it to art. Hope all my friends are having as much fun as me. Going out to that mailbox is going to be exciting. All participants are to send me pictures before they send them off to the waiting girls so I can post them here. Stay tuned.